Hi just a quick heads up Euro Car parts special offer means that you can get 5lt of fully synthetic oil for £12.49. I am nothing to do switch them but at that price I couldn't resist and got 2. My engine uses oil so by my accounts, between services this should last me 4years!! in hindsight 1 would have done. Remember to use the additional discount code otherwise £17.99 as it isn't obvious. I always keep an eye open at Halfords as they sometimes discount Mobil 1.
csm180 wrote: Hi just a quick heads up Euro Car parts special offer means that you can get 5lt of fully synthetic oil for £12.49. I am nothing to do switch them but at that price I couldn't resist and got 2. My engine uses oil so by my accounts, between services this should last me 4years!! in hindsight 1 would have done. Remember to use the additional discount code otherwise £17.99 as it isn't obvious. Which oil and what is the discount code? I'm going to do the 2 yearly oil change myself so went for the free filter deal and got 10lt and an oil filter for £58. Discount codes are all on the site SERVICE25 gets 25% off service items and free filter with some oils. Sold E86 3.0si Sport, Sapphire Black, AC Schnitzers, carbon badges, ZHP, stubby and NO RUNFLATS! Which oil are you specifically talking about? Can't see any that match the BMW specs at that price - although I can see loads that don't. Or are you just using any old 'synthetic' oil (including the ones that are not really synthetic at all). The cheapest I can see for your car is the Petronas Engine Oil (4Ltr Syntium 3000 5W-40) at £21 (before discount) - which doesn't have any BMW approval, and is a synthetic blend. Some bits now over 163,000 miles, some less than 1,000 miles. Just bought 4L of Castrol Edge 5w30 (LL-04) for £27.99 delivered. Code was OILBONANZA30. 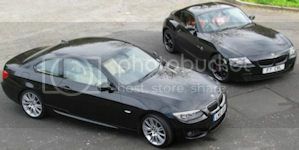 Just received and clearly marked BMW LL04 - each 5lt comes with a free oil filter so I've ended up with 2. If anyone needs an oil filter for the cost of postage PM me. Is this the one? £41.99 now! £38.99 but with code SERVICE30 it's £27.29 or 29.34 with SERVICE25. SERVICE25 works out more for the oil but gives you a free oil filter. Never heard of that oil. Not knocking it, but is it any good? Happened to be in Costco today and you can get Castrol Edge 5w30 for about £28 for 5l, so personally I'd stick to that. I looked at the Castrol 5W30 in Costco and it wasn't the same spec. I think it was A1 instead of C3. This stuff is C3 and states BMW LL04. But who knows if any oil is any good. My car is due a service next year anyway so it won't be in there that long. If the oil was going to be in there for 2 years I might be a bit more fussy. The Costco stuff is the proper grade, but understand if it's only in a few months and of course not everyone can get into costco.